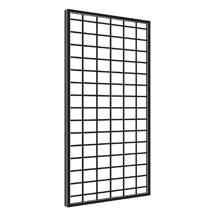 The Heavy Duty Grid Wall Panel has a 1 in. square tubing that surrounds the grid to add extra support and durability. They can be hung vertically or horizontally. These grid panels can accommodate 3 in. grid shelves and accessories to complete your display. The 84 in. high panels are available in 24 in. or 48 in. wide. Wall mount hardware included. Available in black or white. For even more products, we invite you to take some time to review our whole inventory of grid panels at Specialty Store Services now.